Alfalfa tablets are made from the sprouts and leaves of the alfalfa herb. The plant which is also known as Lucerne or by its scientific name – Medicago sativa – belongs to the pea family and grows natively in parts of Asia. Alfalfa is a rich source of important vitamins including Vitamins A, D, E and K as well as the entire family of B vitamins. It is a great source of vital minerals like magnesium, potassium, iron, calcium and folic acid. Alfalfa is also an extremely good source of amino acids and protein especially when compared to other plants which may be especially beneficial to vegans. The name alfalfa is familiar but did you know where the name comes from. It is actually taken from the Arabic word al-fac-facah meaning the ‘father of foods’ because of its very rich nutritional make up. Its health benefits were recognized thousands of years ago in various parts of Asia by people who not only ate the plant themselves but also used it to feed their animals and to fertilize their land. Evidence that alfalfa was used by our ancestors thousands of years ago has been discovered in 6,000 year old Persian ruins while it is mentioned in ancient Turkish literature written in 1300 B.C. In China, traditional practitioners have used the herb to treat ulcers and as an appetite stimulant. Practitioners of Ayurvedic medicine in India have used the leaf to treat arthritis, gout, water retention and stomach ulcers. When the plant made its way to North America, colonial settlers used it to treat arthritis, scurvy, menstrual problems and urinary tract complaints. Native Americans also made use of the plant. They used its seeds as a nutritious additive and a natural thickening paste. American herbal practitioners in the 19th century used the herb as a general tonic while it was also ground and used as a poultice to treat insect bites and skin irritation. The many traditional used of alfalfa have been put to the test by modern scientific experiments and while some may require further evidence to confirm its uses, the findings have been generally positive. Numerous studies have demonstrated that alfalfa can help reduce cholesterol levels and reduce the risk of diseases associated with elevated cholesterol most notable heart disease. The herb and its seeds work by reducing the level of lipids found in the blood. Other similar and many more recent studies have demonstrated similar results including this recent study published in 2014. The study which was conducted on hyperlipidemic rats concluded that alfalfa saponin extract had great future potential as a natural treatment for hyperlipidemia. Because alfalfa has natural diuretic properties, it can help us to flush toxins out of our system and purify the body. These natural diuretic abilities mean it has traditionally been used to relieve water retention and to treat infections of the urinary tract. Natural diuretics like alfalfa are considered to be a much safer option than a remedy bought over the counter because they do not contain the potentially harmful chemicals that may aggravate the condition and cause other side effects. If taking supplementary tablets is not your thing, alfalfa can be made into a pleasant tea that can really soothe your stomach and improve digestive functions. 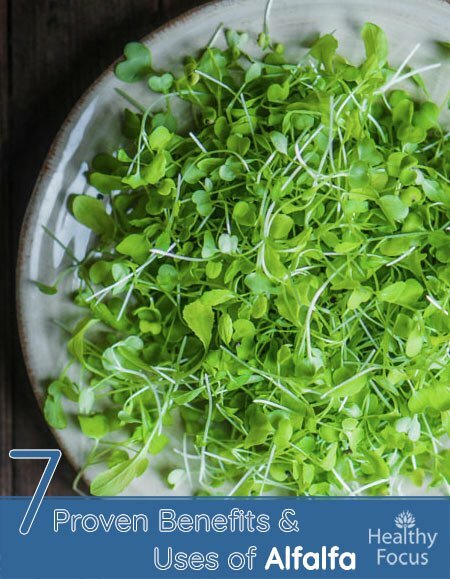 A study published in 2012 which took a general look at the overall nutritional and health benefits of alfalfa found that it had a range of nutritional and health benefits. According to the researchers, supplementation with alfalfa extract was perfectly safe even in the long term and could be used as a general supplement for nutrition. The millions of people around the world suffering from painful arthritis and gout flare ups might get some relief from using alfalfa supplements. Alfalfa may help to neutralize the buildup of uric acid that is responsible for much of the pain. Trace minerals in the herb can also help to strengthen and rebuild joint tissues. Alfalfa may also help treat and manage muscular aches and conditions like bursitis. There is little in the way of hard research but there are many people who believe that alfalfa supplementation can help to control blood sugar levels making it an excellent option for people with diabetes. What we do know is that many of the minerals found in the herb can have a positive effect on blood sugar. Minerals like potassium and chromium help convert blood sugars into glycogen and prevent insulin levels from spiking. Alfalfa is commonly available these days in a variety of different forms. There are no recommended dosage guidelines for alfalfa supplementation so make sure that you read the instructions on the label and talk to a doctor of you have any concerns. Alfalfa leaves can be made into a tea although many people find the taste a little on the bland side. Because it has little taste. it can be added to smoothies without adversely affecting the flavor. The herb itself can be eaten as a healthy and nutritious food and added to soups, salads, casseroles and the likes. Alfalfa is basically a nutritious food and the chances of adverse effects from taking its extracts are very small. Some people however have noted mild stomach upsets. There is no data regarding its safety for pregnant women and it should be avoided to stay on the safe side. People with autoimmune disorders or taking medications for such disorders should consult their doctor before taking alfalfa.